Sync Outlook contacts and calendars with Google. 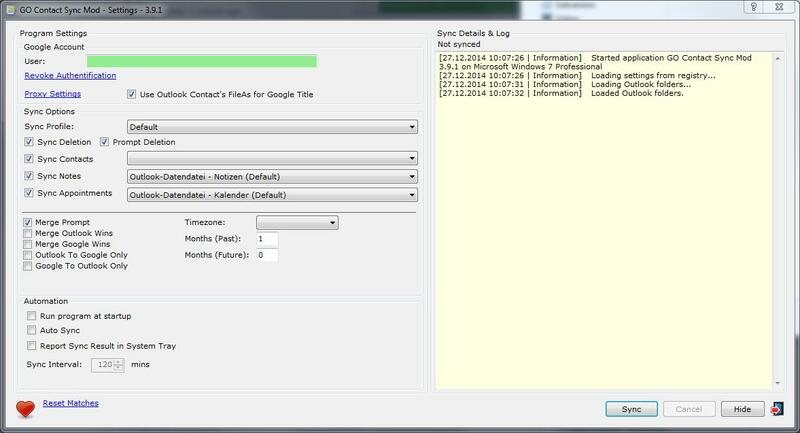 GO Contact Sync Mod is an open source tool to synchronize your Microsoft Outlook contacts with Google Mail. With this tool you do not need to enter your contact details more than once, always have the latest version everywhere: in Outlook and in Google. Contact categories are supported, as well as contact photos to make your contacts look exactly the same. You can set up sync options to start up and synchronize automatically, so it is the perfect backup tool. This project adds various enhancements and bug fixes to the currently (presumably) dead project Go Contact Sync. Set a name for your "Sync Profile" of your choice. It must be unique in each computer and account you intend to sync with your Google Mail account. If you want to synchronize deletions, check the option "Sync Delete"
Merge Prompt will ask you which contact to overwrite on conflicts. Merge Outlook Wins overrides the Google contact on conflicts. Merge Google Wins overrides the Outlook contact on conflicts. The "Reset Matches" button removes links between Outlook and Google contatcs to start from scratch. If you accidentaly deleted a contact, click this button. 1,237 5,728 CreateSoftware <img src="https://www.oldergeeks.com/downloads/gallery/thumbs/GO Contact Sync Mod1_th.png"border="0"> Nov 14, 2018 - 12:46 3.10.19 3.72MB MSI , out of 17 Votes.